King Solomon advocated equitable dealing with others, and a respect for the poor – who, according to his Proverbs, were more virtuous than the greedy rich. “The blessing of the Lord is upon he head of the just,” the King says in Proverbs 10:6, “but iniquity covereth the mouth of the wicked/” Today, victims of fraudulent practices committed by major US banks after the housing collapse believed justice was served in the form of settlement checks from the case – only to find that those checks are bouncing. It’s been nearly four years since a group of the nation’s largest mortgage lenders agreed to a settlement in lawsuits charging them with fraud, wrongful evictions and other abuses in the “robosigning” scandal of 2008-9. The settlement is the result of legal action taken by the attorneys general of all 50 states to prosecute major banks, including such big names as Bank of America, Citibank, JP Morgan Chase and Wells Fargo, for massive abuses arising from the wave of foreclosures spawned by the housing collapse of 2008. 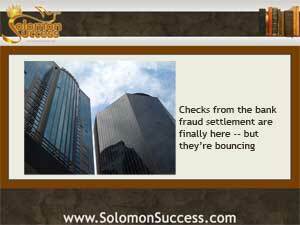 The banks settled the case for $3.6 billion, in an agreement that called for victims of their malfeasance to receive a percentage of the settlement. Now, after a three-year wait, the first round of checks were mailed in early April 2013 to 1.4 million former homeowners. But when some of these victims attempted to negoitiate the check at local banks, they were told that the promised funds were not available. The problem, say legal and housing experts, lies with Rust Consulting, a firm charged with moving the settlement money into an account at Huntington National Bank in Ohio for distraction to the victims n the case. Rust, a frequently used intermediary in class action and government lawsuits, apparently keeps accounts empty as a matter of practice until the end of the day, when it fulfils requests for payment on issued checks. But although Rust spokespeople insist that the problem has been fixed, and the Huntington National Bank confirms that the funds are really available, the check recipients, having beem burned too many times in the past, remain wary. And with reason – the time delay and other factors may make some checks difficult or impossible to negotiate. In some cases, checks were issued jointly to married couples who have since divorced, or issued to a name the recipient is no longer using. Because of all the glitches, housing advocates worry that some people won’t even try to cash their checks, fearing a scam. And with payouts averaging $3,000, these checks can make a significant difference to a struggling homeowner.